I read this book a few years ago, and was not at all impressed. 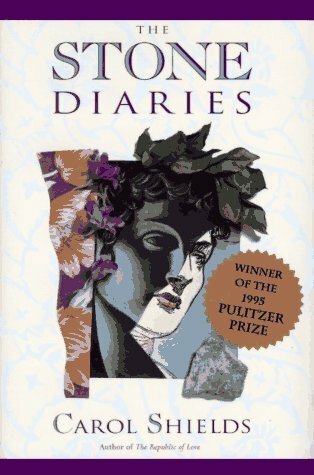 Although it won the Pulitzer in 1995, I find that particular prize to be fairly hit and miss (I loved Alison Lurie's Foreign Affairs and Michael Chabon's The Adventures of Kavalier and Clay, but others I haven't liked so well). For whatever reason, I decided to give the book a second airing, and just finished rereading it. Unfortunately, Daisy Goodwill Flett remains a pretty boring individual, and something of a cypher. But I realized that might be the point. We are, essentially, cyphers to those around us, and so frequently to ourselves, as well. And although the story still left me a bit cold, I really enjoyed Shields graceful prose, and the way in which she poked fun at biography as a medium of communication. Sent to Willemijn, a Carol Shields fan, in the Netherlands as a surprise addition to a parcel. I hope that she enjoys this volume and if she's already read it, has an opportunity to share it with someone else. What a lovely surprise to find another book in the parcel FuryIII sent to me! I really love Carol Shields, she knows that, so it's great even to touch&smell this penguin edition. I've read it ~ of course :-) ~ so it is available for further crossing. I'll find it a welcome new home. I will try to make a fellow bookcrosser enthousiastic for this book at a meeting we will have today. willemijn radiantly recommended this book, how could I refuse it! beloofd aan biba89, dus ga hem nu snel lezen! A diary, a biography, a novel? Telling the story of Daisy Stone, from what turns out to be her surprising birth untill after her silent dying, this book contains the stories of many people's lives. Seen through Daisy's eyes, mostly, accompanied by thoughts that dwindle on many things surrounding the people in her life, commenting on the way she is describing her own doings (and not-doings). At first, I was taken by the words, touched. Then I thought I would not finish the book, when the distraction of thoughts described took so many pages I could hardly say what the story was any more. And then, suddenly, it had me again, and I let myself be taken on the waves of a life's story, and that of a family. It is off to biba89, hope you will enjoy it! Released on Thursday, April 24, 2003 at to fellow bookcrosser in to fellow bookcrosser, sent it by mail Netherlands. Dank aan jgralike, ik ga het lezen zodra ik het Ritsloze nummer, door Niana achtergelaten op mijn keukentafel, uit heb. Ik ben benieuwd, wordt dit een nieuwe Kingsolver voor mij? And to Fury III, in English: I'll let you know what I found in these pages as soon as I have finished them. This book looks like a biography. And, like the former bookcrossers, I do not know either who Daisy Stone is, really. Or what moves her. The book itself though is fascinating enough to want to keep reading. The strangest thing I have encountered in the book: real pictures of real people as characters from the story. Playing with the concept of biography? I found the concept quite chilling. Pondering about it I thought they were no different from actors in a film, pretending to be someone else. But to me it felt as if the writer borrowed the existence of these anonymus people for her own good. Nevertheless, I enjoyed this book. Release planned for Tuesday, May 13, 2003 at to fellow BookCrosser in Deventer, Overijssel Netherlands. funny: biba89 returned an envelope that previously carried a smelly dog treat. now it comes back containing the stone diaries and it smells of flowers! apparently there are no hard feelings because the book travelled in company of a beautiful red jasper gem stone. thank you biba! much appreciated! about the book, i'm very curious what it will be like. especially after the mixed impressions of other people. this book hasn't been spoken for, so it won't be on the very top of my tbr list - though i do have someone in mind who might enjoy it. still, if you would like to be next, feel free to let me know. sad news, alas, also has a place in the history of a book. today, carol shields passed away after loosing her fight with breast cancer. this book has been promised to jolanda. i tried to put up a non-american "rest of the world" bookray to commemorate the author's death but got only one reply. luckily thnxandyc's simultanuous american bookring received a bit more enthusiasm. as a result, it's totally up to jolanda what the future of this book looks like. since the beginning of the month i've been trying hard to finish the book. but somehow that's not so easy. will report back when i have more time. it took me a lot of effort to get a grip on this book. i'm very fond of the idea, you see, of creating a life story and having it commented by everyone who could have played a role. the photos in the book are the same thought as ottawabill's project: found photos receive a story to go with them. an old technique, but fun to do! what tired me much was shields' style. the story kept going in endless circles. it was nice to get more depth every time, but to keep going required an interest in the protagonist's life that reached way beyond my stamina. kaleidoscopes are more fascinating to the patient, i guess. in the end i tried grazing the stories and that didn't work either. so even though i gather i've read most of the book or maybe even the entire book, i'm not quite sure. Released on Tuesday, August 26, 2003 at controlled release in hilversum, noord-holland Netherlands. off daisy goes, to jolanda, in a true bx envelope. i think it's the fifth book that travels in this wrapping! I've received the book today. As there are several books waiting to be read, it can take a while before I start this one. I finally read this book. I'm not sure what to think of it though. It took me quite some time to get myself in the story and half way the book I started to enjoy it. However towards the end I got bored again. OVerall a nice book to read but not a book I will read for a second time.